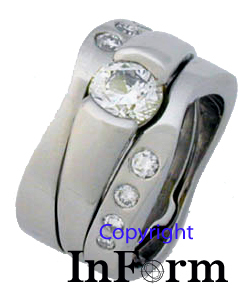 Seen below are the engagement ring which I made first with the platinum wedding bands I made afterward. The photos seen on the left and the top center show the group of rings from an assortment of vantage points. 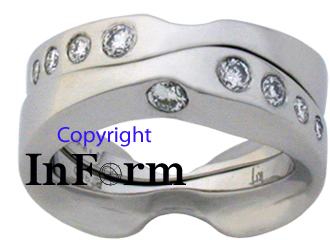 The wedding rings are made to fit very snugly, one on either side of the engagement ring. 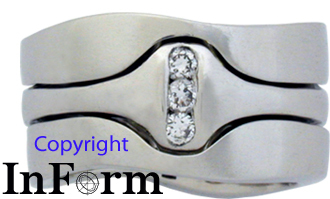 When the engagement ring is removed, the wedding rings are reconfigured to the opposite side of one another and fit very snugly yet again, enabling a person to wear the rings in different combinations each giving a distinct visual option. 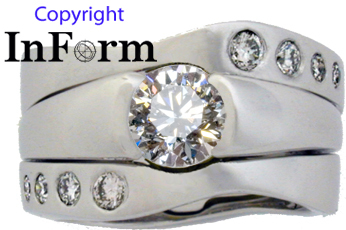 Very often, the groom is looking for a wedding band with shapes and forms that visually relate to one or a combination of characteristics found in the bride's engagement ring and/or wedding rings. 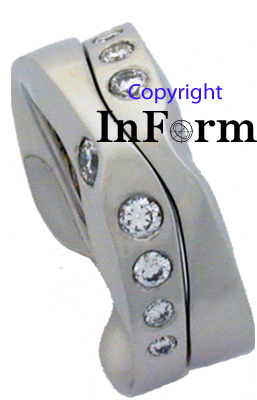 I've included a small picture as a link to a separate page revealing more about the groom's ring. If you're interested, I'll let you check it out and see how the rings relate.